Return of the Untamed Billionaire Every night, prima ballerina Anya Ilyushin dances for Roman Zverev – the man who once captured her heart, before shattering it. Anya has buried the fragments behind an impenetrable wall, but when Roman saunters into her dressing room, their fierce attraction is rekindled… Beneath Roman’s wealth and sophistication lies an untamed wildness – there’s nothing civilised about what he feels for Anya! He left before their longing could consume them both, but memories were branded onto his soul. Now he’s back and determined to make Anya his own! Signed Over to Santino Reeling from a family tragedy, champion figure-skater Carla Nardozzi loses her virginity in one uncharacteristic night of oblivion with Spanish aristocrat Javier Santino. She flees the next morning not knowing her rejection has earned her a black mark… Three years later, Carla needs Javier’s help and he seizes his opportunity for retribution: Carla must become his lover to save her home. Javier should be satisfied; his ice princess is thawing once more. But as the passion heats up between them, Javier realises he’s found something even sweeter than revenge! Wedded, Bedded, Betrayed Elena Ricci never expected her two-day getaway to end in blackmail, forced marriage and the need for a successor. But that’s what happens when Gabriele Mantegna kidnaps her! With Gabriele holding documents that threaten her family’s reputation, there’s nothing fiery Elena won’t do to stop their release. Including marrying the man who would betray her. 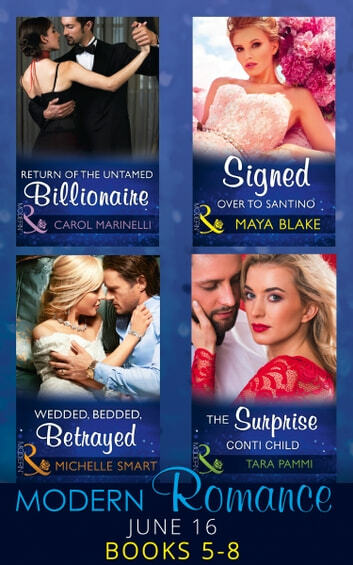 But as Elena's body ignites with Gabriele’s every touch, what will happen when the chemistry that blazes as brightly as their hatred leads to a legacy that will last a lifetime? The Surprise Conti Child After nearly losing her life, Alexis Sharpe determines to tell Leandro Conti about their child. It’s been seven years, but for her daughter she’ll face him and hope her heart remains intact… Known as the Conti Saint, Leandro’s passionate encounter with Alexis is his guilty secret. Following the death of his wife he forbade himself the indulgence of a woman but Alexis remains the one irresistible temptation.